Sometimes this site is bestowed with awards from other webmasters.We're proud when someone acknowledges the work done here with a kind comment via e-mail or with an award.Positive comments from visitors such as you keep us motivated and challenged to make the site even better so to all who send us thanks we'd like to thank you if you'd like to send us an award or praise then e-mail us at seanchaidh@rocketmail.com if you have a complaint then send those as well.You can if you so choose nominate us or your own site for The Celtic Thistle Award. 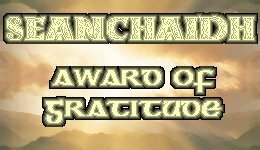 The Seanchaidh Celtic Music Awards are given out every March to anyone in the Celtic Music world to post on their website.Winners are chosen by visitors with one award going to Webmaster's Choice.The catagories are for Male artist,Female artist,Group and Best New Artist Solo/Group.This year we plan to have catagories for unsigned or independent label artists.The blank space beside the award name is where the catagory is inscribed. The Seanchaidh Award of Merit is given to sites each month that our visitors recommend to us that deal with anything Celtic.Visitors can't vote for their own sites and there are two awards one for commercial sites and one for non-commercial sites.All the winners will be listed here and each site that gets the award gets nominated for Seanchaidh's Visitors Choice Site of the Year. The Seanchaidh Award of Gratitude is given to people who have websites who in some form or another helped this site prosper and thrive by either submitting articles to us or recommending us for major site awards getting us ranked higher in search engines or in easier terms people who have gone all out to help this site out.It is also free to use for anyone who promotes Celtism via their own site. 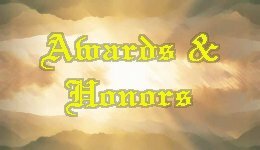 NOTICE!-The Award of Merit is copyrighted and if someone uses it without permission we will prosecute and do really nasty things.